Boost Your Buzz $1,000 Summer Giveaway! One lucky person is going to win $1000 USD paid via Paypal! The giveaway started today & runs until August 15th 11:59 pm EST. Open worldwide. $1,000 CASH prize will be delivered via Paypal as soon as the winner’s entry has been verified. This could be YOU! 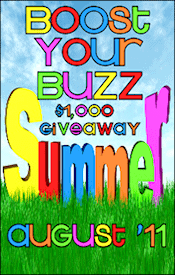 Boost Your Buzz $1,000 Summer Giveaway can be entered on Survey Junkie, Simply Stacie or Little Yaya’s (you only have to enter on one of the sites as the forms will be the same on each). This is such an easy set up. My blog is participating in this event. So please go enter to win! *IF* you are stopping in over the next 2 weeks because of this event, THANK YOU and welcome to my blog! CLICK here to get the details and to enter. It is set up so you only have to go to ONE website to enter!! Nice! Really hope to win this!! Hey there! Following you from Money Saving Mindy! I'd love a follow back!